Please join us for amazing trekking in Nepal Himalaya & tour of Tibet, Bhutan & India - south e.Asia! Super views included in your room price - no extra cost!! Who made a historic first ascent of the world's highest peak, Mount Everest Nepal a tribute to such adventurer and a true hero. May his soul rest in Peace.., Now onwards, the Lukla airport will be termed Tenzing-Hillary Airport and the Everest base camp trek route will be named as Tenzing-Hillary trek route to honor you. Also May 29th will be known as the Everest day! Unimaginable experiences awaits you in the Himalayas!!.. Last updated on , 25th Aug, 2011 ! Bookings open for 2011 Nepal trekking / tours!! Also tour and trek to India, Bhutan and Tibet. Please Contact us now for details! 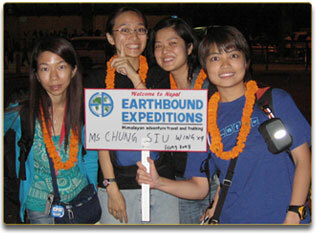 Welcome TO EARTHBOUND EXPEDITIONS - 14 YEARS OF EXCELLENCE!! At Earthbound Expeditions we specialize in a small groups eco adventure travel and trekking to the Himalayan countries of Nepal, Tibet ( China), Bhutan and India in professional manner. We offer numerous pre-arranged treks and tours as well as planning and support for custom trips or expeditions, from scie ntific research to the most remote corners of the Himalaya, to pure vacation travel. Mount Everest trekking hiking or Taj Mahal tour, Potala Palace or Pokhara tour, Annapurna trek or Ajanta Caves, Holy Mt. Kailash tour or Kushinagar, Lumbini tour or Langtang trek, Boudhgaya or Bhutan tour , Ladakh trek, Sikkim Darjeeling or legendry Great wall of China we have all tours for you in competetive price with personal touch! We offer you travel services and an experience that surpass those offered by the large international companies; with the reliability that many local outfits lack. With no overseas overheads and not spending money on flashy ads or expensive promotions, Earthbound Expeditions can offer the highest quality tour and trek packages at competitive prices. You will always get excellent value for your money and funds goes directly to the local community here in Nepal. Enjoy "HOLIDAY ABOVE THE CLOUDS".. truly "A JOURNEY OF A LIFE TIME"... with us. Please join us for amazing trekking, hiking and walking holidays in Nepal Himalaya. Please book our trekking tours direct online and take advantage of our expertise and experience. With our commitment to safety, dedication to provide the most carefully planned and executed adventures, and knowledge of the countries and her people; We can take you on an exhilarating and unforgettable journey through one of the most magnificent places on earth; where legend holds the truth and heaven meets the Earth! an amazing place to be..! We have multi-country tours in South east Asia Nepal, Tibet, Bhutan and India. Read Reviews from Real Travelers!! To get a first-hand consumer opinion, please browse our Testimonials pages... Our customers have been our "Ambassador! Giving back - booking tour with us means you support our philanthropic events. That is why with so many tour companies out there you should choose us..
beside travel and trekking business we also believe in our responsibility towards our society and good Karma (deeds). We have been part of various social activities & philanthropic events. Please take the time to read what makes us different than most tour and trek operators in Nepal. We have been supporting orphanage in Nepal to sustain ( please click here to view our work). We are proud to sponsor the Nepal trek of overland-underwater.com, a charity drive from UK to NZ for CARE international. We practice responsible and sustainable tourism in the Himalaya! Read Reviews from Real Travelers here!! - Few things speak louder and carry more meaning than first-hand experiences and personal testimony.. Please book direct online trekking and tours to Himalaya with us & save!! We have served thousands of clients from around the globe, please browse our pictures section to get first-hand infomation about us..
We are at your service for trekking, hiking, Himalaya Expeditions, Rafting, Cycling tours, Nepal cultural tours, Tibet tours, Bhutan tours, India tours, Kailash tours, we have unique incentive packages, multi country tours, natural and cultural tours in the highest mountains on Earth: THE MAJESTIC HIMALAYAS! Our customers range from single travellers to large multinational corporations. Whether you are travelling alone or as part of a small or a large group, you are our focus!! We will give you the freedom to plan your own trip and customize your itineraries as you desire and your chosen itineraries will considered to be the best and make your trip to Himalaya truly unforgettable experience!! as we direct represent the destinations you will always get first hand information, your itinerary will be crafted by experienced field leaders not by the managers at office. 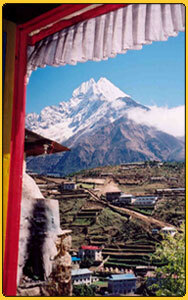 Although Nepal is known as the trekker's paradise, Nepal has more than mountains to offer e.g. UNESCO world heritage sites, Golf tour, Casino Nepal packages, Disco, Nepal mountain biking, Avia flight, Mountain experience flights, Fishing tour, Nepal heli trekking and heli hiking, bungy jumping, paragliding, easy city tours with 5 star hotels, Spa, marriage and Honeymoon packages, Filming locations, Yoga trekking and tours, peaceful Meditation centers, nepal home stay treks, photography and festival tours, Buddhist and Hindu pilgrimage tours. Nepal is totally safe destination to travel and trekking now. There is an overwhelming peace & tranquility that prevails throughout Nepal : Come to enjoy ".. a world of it's own". The Nepalese tourism industry would like to make a pledge to all tourists to come and visit Nepal; and see and experience it's beauty, grandeur, culture, temples and monasteries, Himalaya mountains and jungles of Nepal. Please see the Comments of our clients who have recently visited Nepal, Tibet, India and Bhutan with us and how much they enjoyed it. Hollywood superstar Richard Gare & Mr. President Jimmy Carter, visited Nepal recently. Cartoonist Ronan Luri to exhibit on Everest : a well known cartoonist for Times and Newsweek, coming in Nepal with a unique goal of sketching cartoons on top of mt. Everest. .."Traveling may be...an experience we shall always remember, or an experience which, alas, we shall never forget." ~ J. Gordon 1896 - 1952, join us for unforgettable experience in south Asia........!! Earthbound Expeditions, an adventure travel and trekking agency in Nepal has over 22 years combined experience in organizing eco friendly small group travel and trekking holidays to South Asian Himalayas ( Nepal, Tibet, Bhutan and India). Humanitiran Holidays in the Himalaya : Volunteer opportunities in Nepal (Voluntourism in Nepal), make an important contribution to the people of Nepal, while gaining an in-depth experience of Nepal's language and culture, that will stay with you for the rest of your lives. If you are interested for life changing experience in Nepal Himalaya, please Click here for details . The volunteer work can be combine with treks and tours or can do some Yoga class / course. Nepal is known the world over for it's ageless traditions, living legends, colourful festivals, magnificent majestic Himalayan ranges, exciting cultural heritage & diverse flora / fauna. Nepal Trekking Agency registered License number : 20 / 457. Book our trek and tours direct online and save!! A Nepalese adventure trekking agency that is operated by Nepalese trek and tour guides who ensure any funds are returned to it's people. 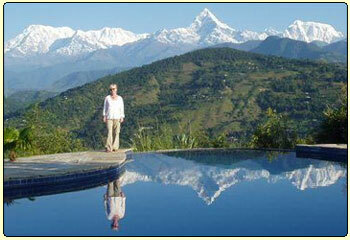 We practice Responsible travel, Sustainable Travel and Ecotourism in the Himalaya !! TAKE ONLY PICTURES, LEAVE ONLY FOOTPRINTS..." we have whole world to explore one world to save"
Earthbound Expeditions specialize in small groups eco adventure holidays, trekking & camping holidays, special interest tours, walking holidays, biking cycling and hiking holidays, nepal heli trekking, cultural tours, small group adventures, family holidays in nepal, nepal trek adventure for 50 plus, multi activity holidays, Honeymoon trips, Himalayan pilgrimage tours, Himalayan golfing holidays, honey hunting treks, Nepal Yoga trek and tours, meditation tours, Kailash - Mansarovar tours, nepal home stay trek, trek and tour for single female travellers, trek for over 50's, nepal holiday as featured in BBC holidays, nepal volunteering activities, cultural exchange tours and nepal volunteer programs for students.